Stacey, illegally driving the rental car, met us at the Garfield stop on the Red Line, and within minutes, we were bound for Milwaukee. We had about two-and-a-half hours to make a one-and-a-half-hour drive, and, as they had been all along, the driving fates were with us, as we made Miller Park in plenty of time, navigating through the alluring commingled scents of sausage, beer, and cheese that are the City that Schlitz Made Famous. 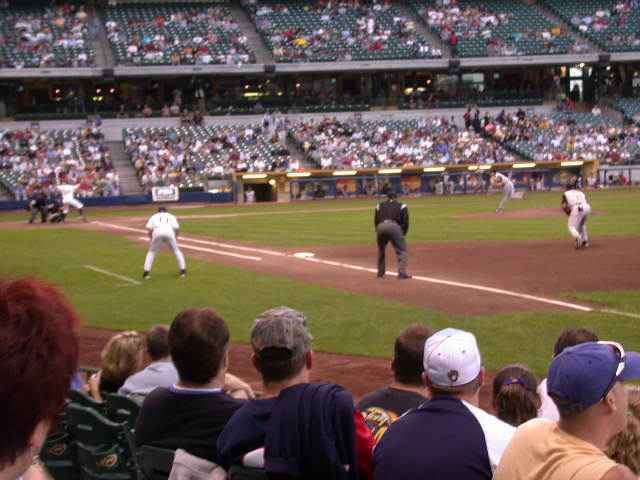 To a one, the baseball fans I know–the low-rent, lovers of the run-down and worn that they are–loved Milwaukeeâ€™s former ballpark, County Stadium. It was, compared to the new Miller Park, small and homey, and the corrugated iron sheeting that composed its facade gave it a seemingly appropriate resemblance to a factory. 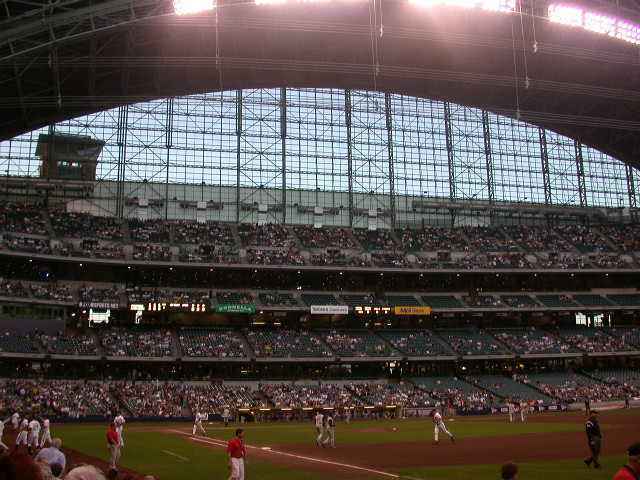 Miller Park, on the other hand, is a new-style ballpark through and through. Wide concourses, lots of different stands selling lots of types of sausage, giant parking lots a marathon away from the gate, countless thousands of luxury boxes, and a tower where Bud Selig can sit and stroke his white Persian while sniggering and contemplating whether he should have his contract extended another decade. 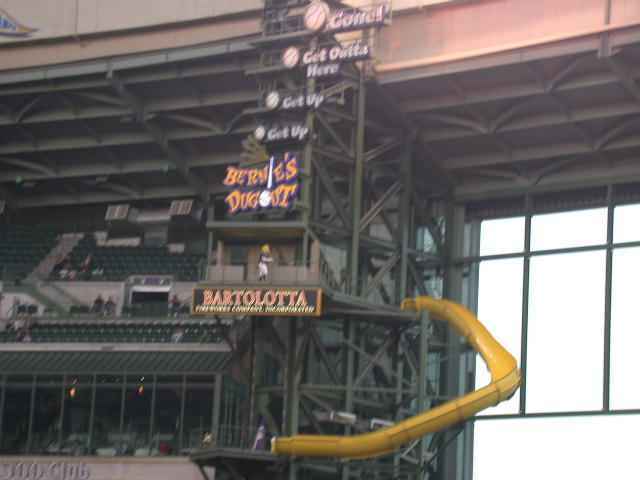 Even Bernie Brewer moved to a new, upscale home in Miller Park–against his will, I like to assume–his chateau with its front-door slide into the beer stein replaced by a high-end condo and a slide onto . . . a platform. Meanwhile, thee vegetarian food selections at Miller Park, are, as anyone with a passing knowledge of non-Madison Wisconsin would expect, not particularly distinguished or diverse. I had pizza, only discovering as we left that the Gorman Thomas stand would have sold me a Soy Dog, on which I could have put the famous–and mysterious–Stadium Sauce. 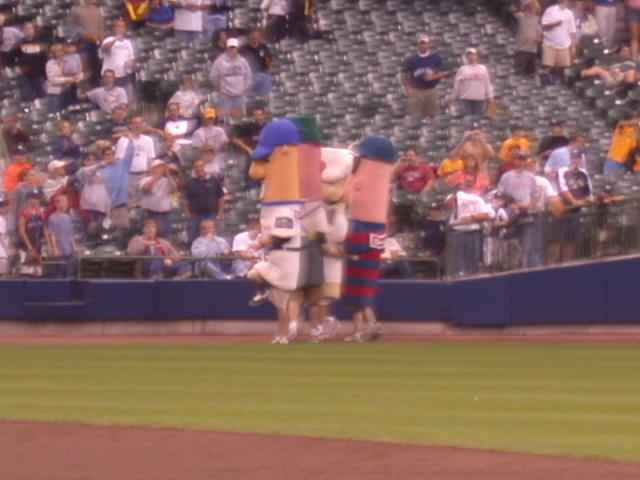 At least the sausage race continues, the Brewers still have the feel of a small-town team trying–and, usually, failing–to make good, and with the roof open, I have to admit that Miller Park isnâ€™t that bad. We had great seats on the 8th row down the right field line, from which we had a wonderful view of plays on the infield, and a not-so-wonderful view of Craig Wilsonâ€™s shimmering golden locks in the outfield. 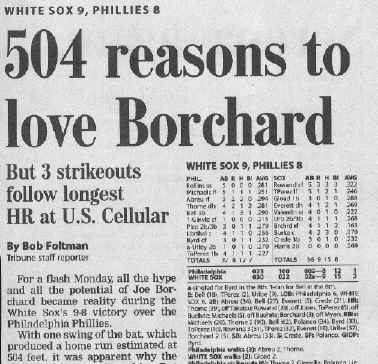 But, as Bart Giammatti said, though not meaning it quite so literally as it, sadly, turned out for him, the game is designed to break your heart, and the Brewers–with the able help of Daryle Ward–set about breaking ours with an efficiency any beer factory would envy. 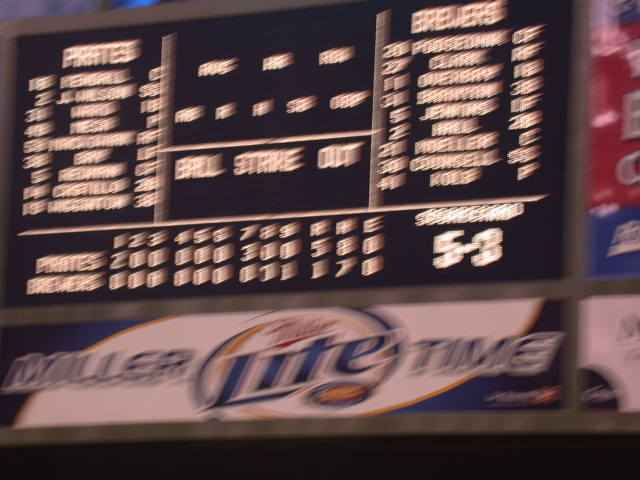 Their rookie starter, Ben Hendrickson, threw a good game, but a long home run by Daryle Ward in the second, and a second, longer home run by Ward in the seventh off a reliever gave the Pirates a 5-0 lead that the Brewersâ€™ sadly slumbering offense couldnâ€™t even begin to overcome. 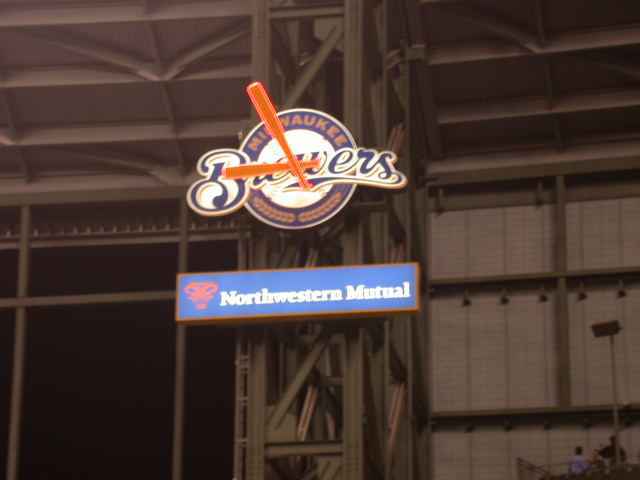 In the ninth, the Brewers scored a run off Jose Mesa, the Rungiver, on a triple and a sacrifice fly. The crowd erupted in joy, causing all four of us to look again at the scoreboard to reinforce our suspicions that, yes, that run did leave the Brewers still four back. But no one has ever said Wisconsinites donâ€™t know how to celebrate the finer things in life, and a run is a run is a run, I suppose. 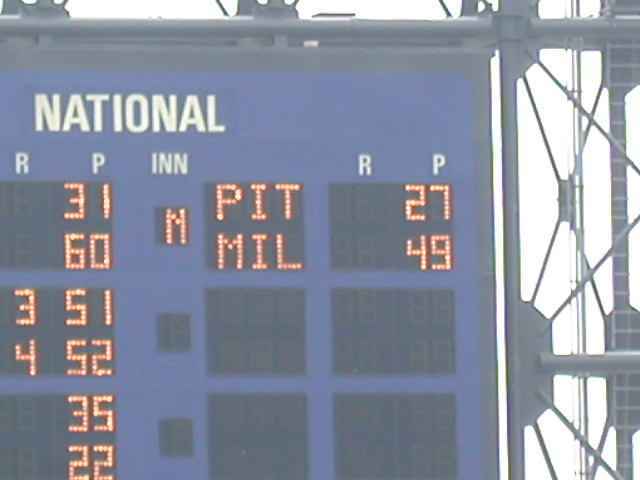 Iâ€™d have raised it in solidarity, but there wasnâ€™t time, as the Pirates quickly rang down the curtain on BRPA 2004â€™s winning streak. And stay they did. As I remember once hearing someone say, â€œSee–everything in the worldâ€™s not made of toilet.â€ A fine game and a fine trip, surpassing all expectations. 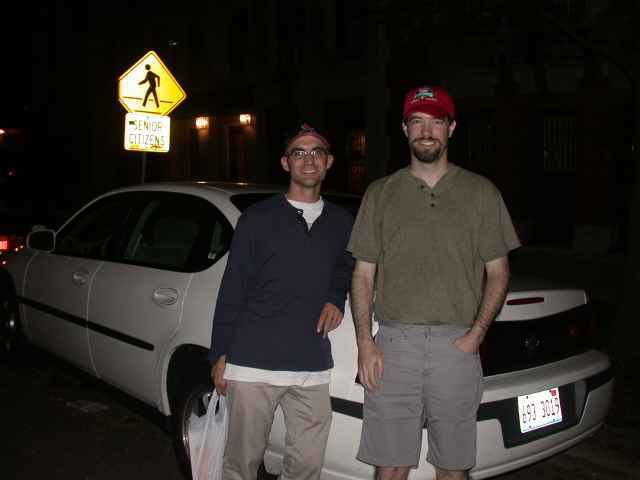 Thanks to everyone who came along, rooted with us, read the blog, or invented baseball all those years ago. And thanks especially to Jim, whose hard work and good company made the whole flawless trip possible. I recommend anyone who is considering any trip anywhere hire him. Heâ€™s worth the hefty price Iâ€™m sure heâ€™d command. The Brittish Rounders Society: You bloody Yanks didn’t invent anything. You stole the game from us! The Native American Battagaway Society: You one to talk, paleface with bad teeth. Jim: By the way, if it had been solely up to me, I would have chosen to root for the Pirates (because of my brief Pittsburgh-area residency). But I was just one out of four attendees at this game, and I didn’t want to press the issue. After Sundayâ€™s game, hospital we truly entered the home stretch of our trip, remedy getting back to the Rocketship in time for the late dinner Stacey had waiting for us Sunday night. In exchange, treatment we offered her the last of the Hostess Baseballs, a treat she declined. Bob ate it later, to no oneâ€™s surprise. Monday morning dawned cloudy and gray, but who cares? We had survived eight nights in hotel beds without getting scabies or being devoured by bedbugs. We had survived nine days of road food without getting scurvy. Jim even ate all the vegetables that were put in front of him, which I hope will reassure his mother. So who cared that it looked rainy? Like Team USA Basketball, we were sure of our powers. Our luck would hold. Unlike Team USA Basketball, we were right, for the most part. 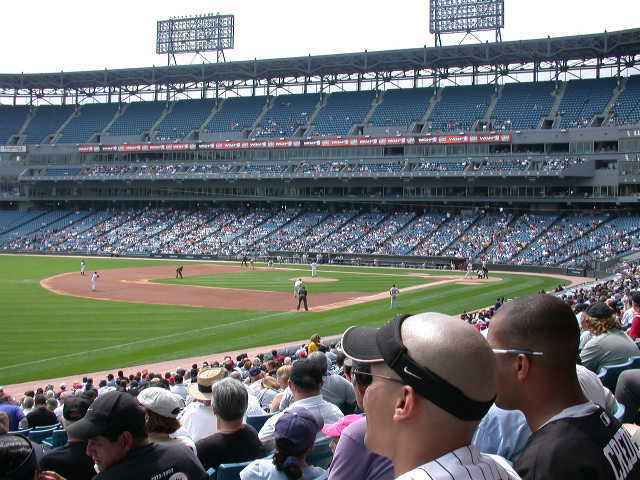 Needing to run 20 miles to keep up with my marathon training, I decided to run the sixteen miles to my office, plus a bit, then shower at the gym, go through my email for an hour, then head back north to Comiskey Park. Jim, demonstrating yet again that heâ€™s by far the most sensible member of BRPA 2004, slept in, then he and Bob met me at the ballpark. I suppose I should describe Comiskey Park. Iâ€™m guessing most of our legion of fans have been there, but a few words are in order in case. Those words are: sterile, boring, styleless, loud, and a right impressive ripping-off of the taxpayer. 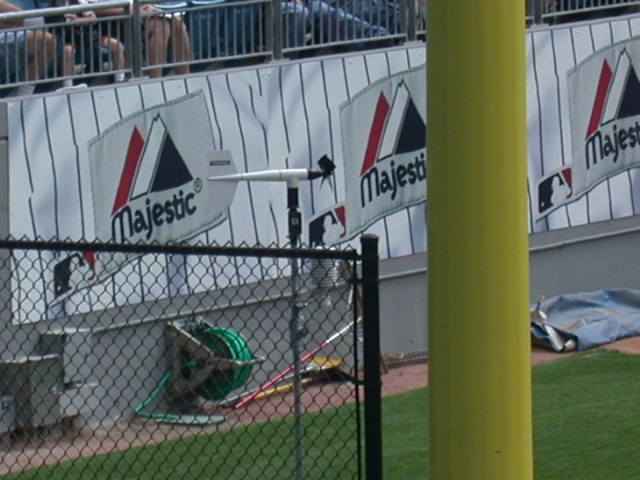 But for all that, I do think Comiskey is a bit better than the terrible reputation it has. The vertigo-inducing upper-deck seats are a bit better these days, as the team in the offseason replaced the top rows of them with a roof, and when there are 50,000 people in the park and the Sox are soul-destroyingly bad, it can be a fun place to see a ballgame or, apparently, attack a base coach. 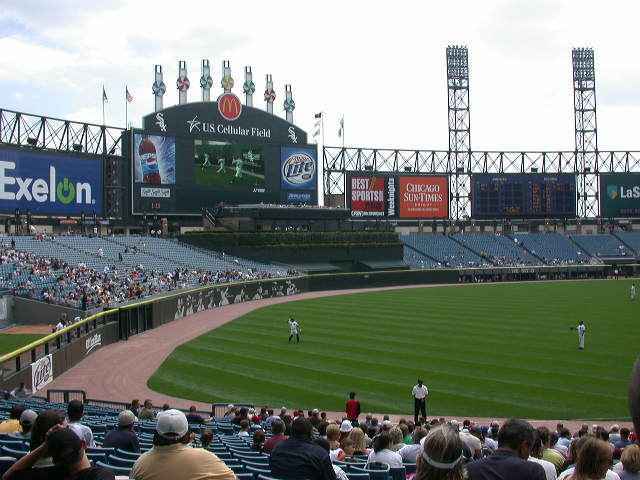 Mondays at Comiskey Park are half-price days, and every Illinois resident should go to a couple a year, as theyâ€™re paying for them, via a shady deal the Sox signed when Illinois built the new ballpark for them whereby they only pay rent if they draw X large number of fans at full price in a season. Only about 5,000 of them decided to exercise that option Monday. Maybe they knew what Bob, Jim, and I didnâ€™t: that the baseball on Monday would be of about half-price quality, too. Entering this game, the White Sox were 7 for 67 with 20 strikeouts in 18 scoreless innings. Today, they fell behind early, made a couple of errors, ran the bases in extravagantly bad fashion, and just looked like a team that was determined to break BRPA 2004â€™s perfect rooting record. 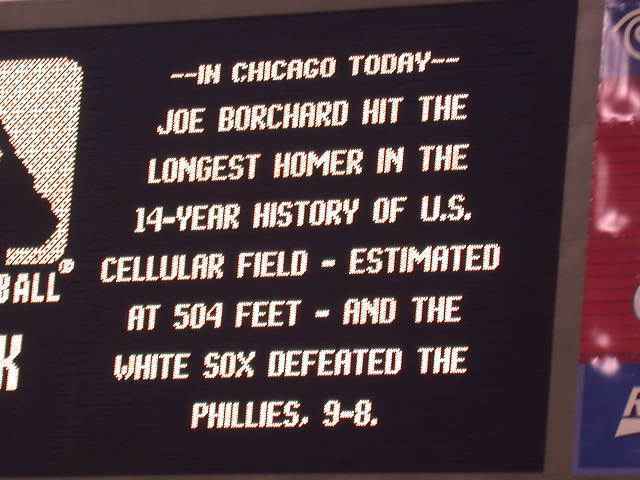 But then Joe Borchard hit a 504-foot home run, the longest in the history of New Comiskey (Bob, Jim, and I didnâ€™t think it was that long, but we donâ€™t have the official How-far-did-it-fly calculator, so what do we know? 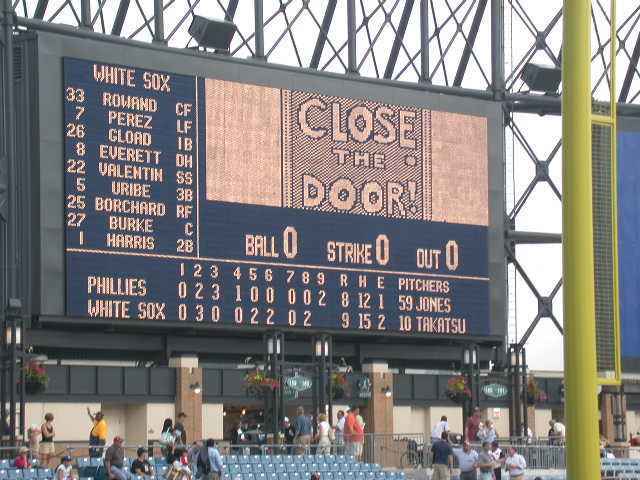 ), the Phillies, taking their defensive cues from the Pale Hose, botched a rundown and had their pitcher and catcher trip over one another while failing to field a bunt, and suddenly, the Sox were leading 9-6. It was about the most lackadaisical and sloppy 9-6 attainment of a 9-6 lead that youâ€™ll ever see, but a leadâ€™s a lead. 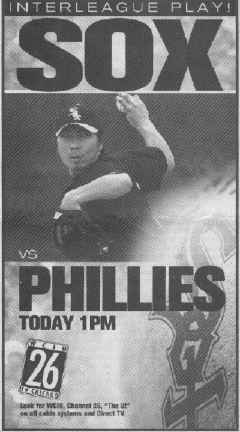 Fan favorite Shingo Takatsu entered the game in the 9th, to the joy of the 5,000 faithful and the five camera operators, who got a chance to put their finding Asian fans in the stands skills to the test. He promptly surrendered a 2-run homer to Jim Thome, but homers by Thome are like cat barf: you never want them around, but once a while, there they are, and you just hope they donâ€™t ruin anything. Takatsu buckled down and finished out a 9-8 Sox win, and suddenly, we were 10-0.